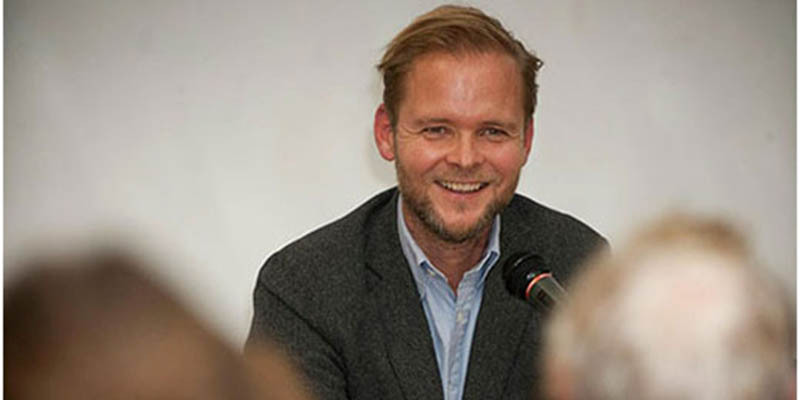 Christian Kracht is one of the most distinguished contemporary authors in the German language. He has written four novels to date that have been translated into over 25 different languages. Yet it was at this bilingual public reading that his work was translated into English for the first time - and by University of Leeds students. During this two-day visit to Leeds – Kracht’s first public appearance in the UK, the author also held seminars on his works and on their translation into English with students and staff in the School of Modern Languages. The passages chosen to be read by the student translators were selected by Kracht himself, who remarked on the consistency of the translations and the professionalism of the readings at the City Library. Kracht then presented the readers with a signed copy of his new novel. The visit, which was coordinated by Dr Giles Harrington and Mandy Poetzsch (German), also marked the first-ever symposium on the author’s work at the Leeds Humanities Research Institute. Professor Frank Finlay, Dean of the Faculty of Arts, was delighted to welcome Christian Kracht to Leeds: 'To attract an author of Kracht’s standing to Leeds is a real coup for the faculty. His reading gave the new International Writers in Leeds initiative a hugely successful launch and also provided our students with a wonderful opportunity to show off their knowledge and translation skills in a packed-out public venue. Their input enabled Kracht’s work to reach an audience unfamiliar with German who wouldn’t otherwise have been able to attend. The format bodes well for future events in the series and the ambitions we have for them to contribute to the richness of cultural life in our city and region'.